Elk seem to pour from the Garvelly Mountains northwest of Yellowstone National Park. I made this photo while flying with Lighthawk - the aerial perspective needed to show the grand scale of large elk herds moving to winter range. Across the West, ungulates migrate out of deep snow to wind-blown lower elevations, needing Freedom To Roam to forage for survival. On a winter aerial mission with LightHawk,flying with friend and outstanding pilot Chris Boyer of Bozeman, sunlight broke through to highlight the tracks of elk flowing from the Gravelly Range. 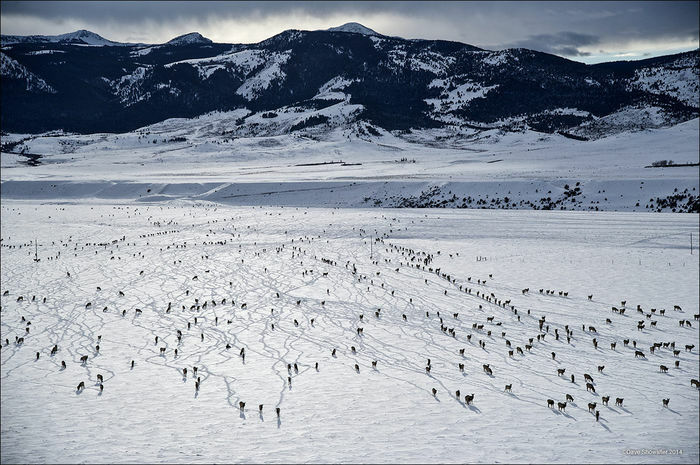 Thousands of elk in herds of hundreds dot the snow-covered Madison River Valley, descending from mountains locked in deep snow to open range scoured by wind. In some areas we could see bare dirt, dug up by elk hooves pawing at the frozen ground. Although the Big Sky Montana landscape feels unbounded, wildlife need vast areas to migrate and find food to survive a long, harsh winter. National Parks, with their perfect borders drawn by man, can’t sustain all of Western biodiversity. It’s up to us to make room. This mission is part of the Sage Spirit conservation project, supported by iLCP. LightHawk has generously provided all of the flights in over five years of work. Posted in Sagebrush Sea on February 21, 2014 February 21, 2014 by Dave Showalter. This is a wonderful project complemented by a unique and beautiful photograph. Great vision and execution, Dave! Thank you, Ed. I had great support from LightHawk and pilot Chris Boyer knows the area very well. The thing was, light was really flat on the way out, but on the return there was some spotlighting happening. Of probably 7-8 groupings of elk, this was the one where the trails really stood out because of the angle of the sunlight. I don’t think it would tell the story as well without the trails. Beautiful sweep to this one Dave, gives the animals’ paths an epic feel in the cilly winter light. AMAZING photo Dave! Your wildlife photography continues to blow me away. Keep it up!!! Thanks Jack and Jackson! That was a pretty “cool” flight experience with the door off on a winter evening.The spotlighting came along and saved the day.